From the Department of Clinical Neurosciences (J.T., M.J.H., R.L.B., D.J.T., H.S.M. 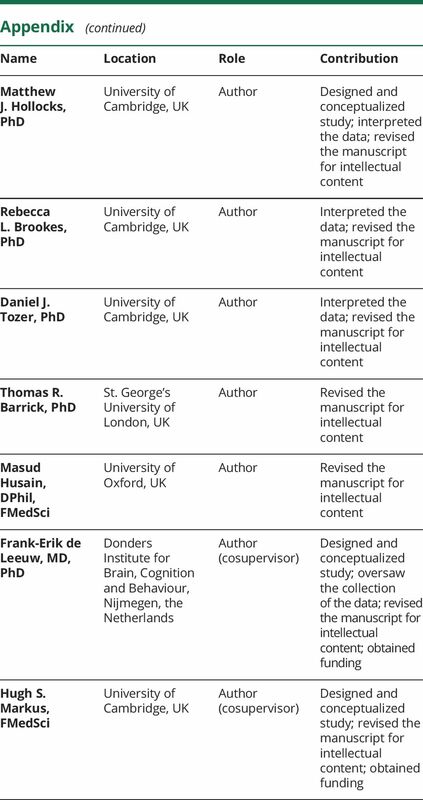 ), University of Cambridge, UK; Department of Neurology (A.M.T., F.-E.d.L. 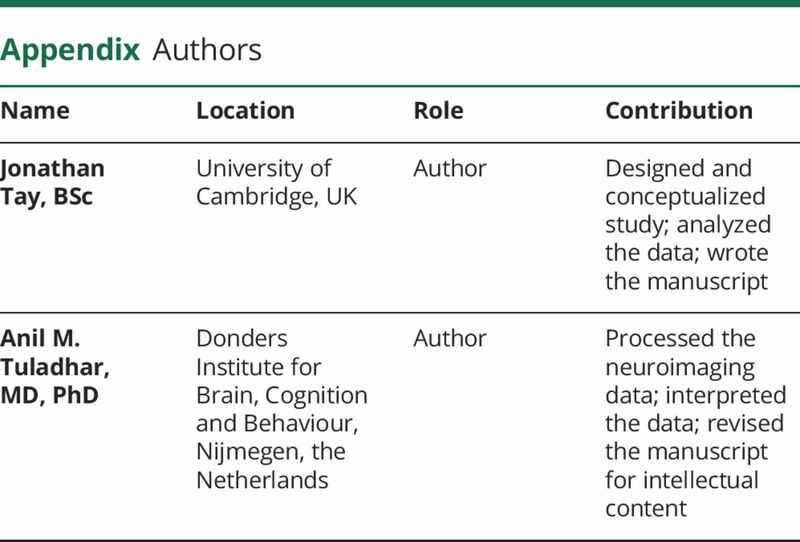 ), Donders Institute for Brain, Cognition and Behaviour, Radboud University Nijmegen Medical Centre, Nijmegen, the Netherlands; Neuroscience Research Centre (T.R.B. ), Molecular and Clinical Sciences Research Institute, St. George's University of London; and Nuffield Department of Clinical Neurosciences (M.H. ), University of Oxford, UK. 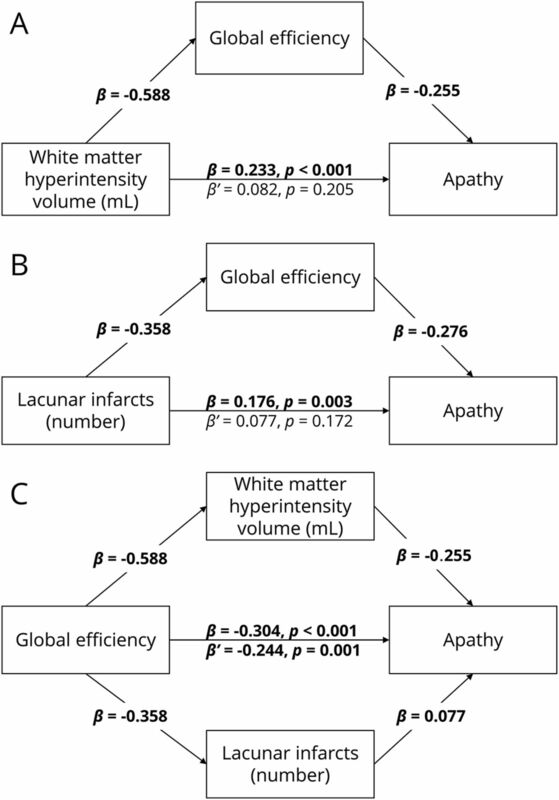 (A) Mediating effect of global efficiency on the relationship on white matter hyperintensities (WMH) volume and apathy. (B) Mediating effect of global efficiency on the relationship between lacunar infarct (LI) number and apathy. (C) Mediating effect of WMH volume and LI number on the relationship between global efficiency and apathy. All numbers represent standardized β coefficients. β Is the coefficient before mediation; β′ is the coefficient after mediation. Significant paths at p < 0.01 after Bonferroni-Holm adjustment are highlighted in bold. (A) Cluster that differed between the apathy group and all other participants. (B) Clusters associated with apathy in all participants while controlling for depression. Nodes are colored according to the unique clusters they form. See table 5 for a full list of significant edges, grouped by topologic cluster. (C) Clusters associated with apathy in all participants while controlling for depression, cognition, and education. Networks were projected on the Montreal Neurological Institute 152 standard space template and visualized from the axial plane in neurologic convention. CAL = pericalcarine cortex; IFGorb = inferior frontal gyrus pars orbitalis; IFGtri = inferior frontal gyrus pars triangularis; INS = insula; MCG = middle cingulate gyrus; MOG = middle occipital gyrus; MTG = middle temporal gyrus; PAL = palladium; PCL = paracentral lobule; PCUN = precuneus; PreCG = precentral gyrus; PUT = putamen; SFG = superior frontal gyrus; SFGmed = medial superior frontal gyrus; SMA = supplementary motor area; SPG = superior parietal gyrus; STG = superior temporal gyrus; THA = thalamus.